ABBLighting, a manufacturer of customized LED luminaires in the United States and Canada, introduced the Human Centric LED Light Troffer retrofit kit. The light panel is specially designed to create comfortable and natural light for patients and anyone in pursuit of high quality healthy living. Utilizing a 38-watt LED source, the panel mimics the natural Kelvin changes of the sun throughout the day in a typical 2' x 2' troffer. The fixture can be set to run automatically or allows you to change the lighting with one of several presets such as sunrise/sunset, best lighting for reading (4100K) or best for working (5000K). With the wireless adjustable color temperature driver, the ABBLighting retrofit kit can easily be controlled by a remote control, smartphone or tablet using an available app. The LED lamp can also be controlled by the wall switch. The adjustable color temperature range is 2700-6500K and has a CRI of of more than 80. "Our goal was to design an indoor light fixture that is healthy for seniors and hospital patients," said ABBLighting President Greg Murphy. "What we quickly realized is that what is healthy for seniors and patients is healthy for everyone." The human centric LED Light Troffer retrofit kit is ideal for hospitals, wellness centers, senior living and other healthcare facilities as several studies show that patients heal faster with access to natural light. It is also marketed towards office and commercial buildings and retail environments. The higher Kelvin temperature settings also make it suitable for aging individuals to read and do other activities that involve close-up work. 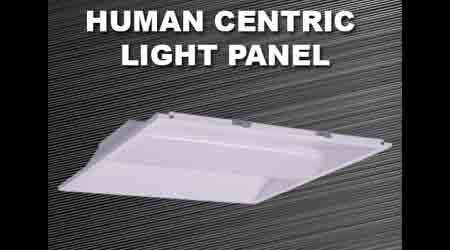 The human centric troffer retrofit kit has a 50,000-hour L70 life and comes with a five-year limited warranty. The retrofit kit is DLC, ETL and Lighting Facts listed.